Now Booking Seminar Dates Outside Of Florida! The IKF and the ISCF (International Sport Combat Federation) would like to make it official that they fully endorse the newly created Wintensity Seminar, The Psychology of Combat and Effective Mental Preparation, as an excellent, "cutting-edge" seminar, unlike any other seminar being offered in martial arts today. If you haven't yet registered for the Wintensity.net seminar, scheduled for this Saturday, February 27th, at the Embassy Suites in Tampa, Florida, you should register ASAP because these seminars fill up fast. There are only FOUR available seats remaining. How the human brain functions under the stress of danger and physical conflict. How the stress of danger and physical conflict directly affect physical abilities. Methods to successfully manage Anxiety, Stress, Pain and Fear. What to expect from yourself in a "Real World" Encounter. How to build "Brain Training" into your Martial Arts Training and maximize your mental and physical potential. How to avoid the "FREEZE, FLIGHT or FIGHT" response to the perceived danger of human combat. How to develop a true "Non-Quitting Spirit"
"The most impressive Knock Out of the tournament!" Eric landed a "Spinning Hook Kick" on a seasoned fighter with a 20-5 record to win his title and became the FIRST FIGHTER EVER to win "4" Tournament bouts by TKO/KO! Eric won his Championship bout at 48 seconds of round 1! This Spinning Hook Kick came after he had defeated all 3 of his previous opponents by TKO as he worked his way through the largest fighter bracket of the tournament. Eric founded Wintensity with the goal of providing a unique training opportunity for students of the martial arts, and to help students of the seminar gain a greater understanding of how to mentally prepare for any physical conflict, including competitive fighting. After serving as a US Marine, Eric entered the field of Law Enforcement where he served for ten years as a street patrol officer, a K9 officer, and a special operations police officer. During his time in Law Enforcement, Eric was a SWAT Team Member for eight years, and a SWAT Team Section Leader/SWAT Instructor for six years. He was also assigned for five years as a patrol K9 Handler. In May of 1999, he was wounded during a shoot-out while serving as a SWAT Team member and executing a high-risk narcotics search warrant. Following five surgeries to reconstruct his left arm and nearly a year of occupational therapy, Eric returned to full duty and was soon involved in additional, similar critical incidents, and successfully avoided further serious injury. These events, along with specific education in the anatomy and operations of the human brain, have laid the foundation for his passion for training in this environment. As his law enforcement career advanced, Eric was assigned to supervisory level duties and promoted to the rank of Sergeant. In addition to being detailed as a Special Operations officer, Eric also served as a trainer, a field training supervisor, and an instructor of department personnel, earning several certified instructorships. These instructorships include; Firearms Instructor, Patrol Rifle Instructor, Chemical Agents Instructor, Less-Lethal Munitions Instructor, Distraction Device Instructor, and Impact Weapon Instructor. Notably, Eric also worked in the private sector, providing specialized "critical incident survival" training to police agencies and military personnel with two Multi-Day courses he developed and entitled, "The Survival Mindset" and "Mental Preparation for Deadly-Force Encounters". Eric adjusted the critical "mental" aspects of these training courses, and combined them with his personal and professional experiences and his extensive experience teaching police officers and military personnel to survive and function at peak efficiency while under stress. Thus, he has created a seminar which is new to the world of martial artists, The Psychology of Combat and Effective Mental Preparation. It is truly the "missing piece" of the martial arts training puzzle. This new seminar is specifically designed to educate and benefit competitive fighters and students of the martial arts (Kickboxing, MMA, Point Fighting, etc. etc.) by providing an easily understood, professionally produced seminar on how the human brain functions under stress, and how to build this new understanding into your physical training. The seminar blends the science of understanding human brain function, techniques from the field of sports psychology, and the personal and professional experiences of the instructor, to create an educational experience that will forever transform the way martial arts practitioners view their training. Eric will present this Seminar in a way that will enhance your understanding of physical conflict, and better prepare you to reach your goals in your martial arts training. Eric began training in the martial arts at age six. With 31 years of continuous martial arts training, he is an active and current competitive Muay Thai fighter with an official record of 10-0 (6 wins by KO). He is the reigning IKF World Classic Amateur Muay Thai Lightweight Tournament Champion, the ISKA Florida State Light Welterweight Champion, and the AIC Florida State Light Welterweight Champion. Eric left the field of law enforcement in 2004 to open a business in the private sector. In addition to conducting seminar training and developing Wintensity, he also owns a real estate finance company with his wife, and resides in Tampa, Florida. "The Wintensity seminar is really the "missing piece" in today's martial arts training. The seminar is just as good for students interested in fitness and self-defense as it is for competitive fighters. The seminar is fun, exciting, and the information and material is totally unique in the world of martial arts instruction and training. I have been teaching martial arts and coaching fighters for 25 years, and I highly recommend it. I would not miss the opportunity to attend this seminar." "Wintensity's Psychology of Combat seminar was better and more informative than any training seminar I have ever attended. As a professional world champion fighter and trainer, I can say that I learned much more in this seminar than I expected, and I really wish I had taken this seminar ten years ago. At least now I can take what I have learned from the Wintensity seminar and pass it on to my self-defense students and "up-and-coming" fighters. You cannot put a price on what I learned at this seminar, and I really enjoyed it." 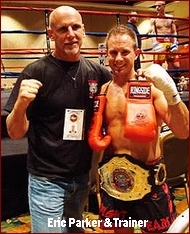 Stefan Butin Bik, Owner and Head Trainer: USA Muay Thai, Crystal River, Florida. Born in Dordrecht and raised in Klundert, Holland (the western world capital of Muay Thai), Stefan is the current national Shin Do Kumate Muay Thai Pro-Lightweight Champion. He is a professional freelance fighter and has been featured on FOX Sports Net, the Sunshine Network, ESPN2 and various Pay Per View productions. Stefan Butin Bik has an impressive 70 amateur fights and a professional record of 12-5. "As a psychologist and martial arts student, I found the Wintensity seminar provided an excellent blending of physiology and psychology in a format that was engaging, innovative, and easy to understand. The lessons presented are not only applicable in the ring and on the training floor, but also in everyday life." Angela Horvath, Ph.D. Research Psychologist St. Petersburg, Florida. "...a breakthrough program.....combines human research with fight tradition... helps trainers get the most from their students on fight night, and helps students get the most from themselves." Richard F. Brown, Ph.D. Ring Announcer and Martial Arts Student Tampa, Florida. "If you ever plan on fighting MMA or competing at any level, you owe it to yourself to go to the Wintensity seminar. Eric Parker has a straight-forward style of teaching, and broke down the content so that I understood him and was engaged the whole time. If you don't know how the brain works under stress (fighting) and what you can do to control it, you will never reach your full potential in competition. I wish the Wintensity seminar was around when I first started competing!!!" Wintensity was pleased to have Matt "No Regard" Arroyo, famed UFC Veteran and co-star of The Ultimate Fighter; Season 6, attending the Feb 27th SOLD OUT seminar in Tampa. Since attending, Matt has strongly recommended the Wintensity seminar, The Psychology of Combat and Effective Mental Preparation, to his own students at Gracie Tampa.